Made for filing saws with 60 degree angle teeth. Triangular shape, edges set and cut for filing gullets between saw teeth, tapers slightly towards the point. Made of high-quality alloy steel with precision-ground teeth. Has file section and rasp section on both flat side and half-round side. For the homeowner, home craftsman, boat builder and mechanic. Rectangular shape, single cut on sides and edges, 2 square edges, red handle, all sizes taper slightly in width. Used for sharpening mill or circular saws or draw-filing and finishing metals. 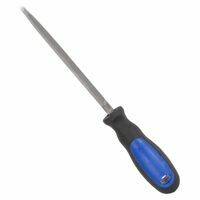 Primarily used to file circular openings or concave surfaces; tapered slightly towards point. Made of High quality alloy steel with precision ground teeth for excellent function. Rectangular in cross section and taper slightly in both width and thickness from tang to end. Comfortable cushion handle with ergonomic thumb grip. Made of high quality alloy steel with precision ground teeth for excellent function. Comfortable cushion handle with ergonomic thumb grip. Rectangular shape, single cut on sides and edges, 2 square edges, all sizes taper slightly in width. Used for sharpening mill or circular saws or draw-filing and finishing metals.